Truro City manager Steve Tully says he is proud of his players after they lost the second leg of the National League South play-off semi-final 1-0 at Maidstone United. Alex Flisher's second-half goal sent the Kent side club into the final. 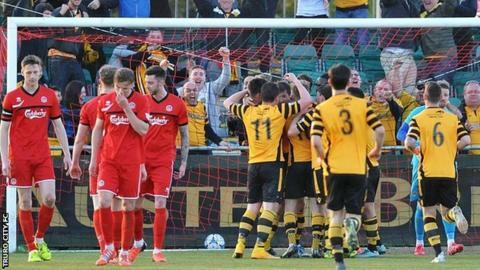 The former Football League side won 3-0 on aggregate after a 2-0 win in Truro. "If we can keep the core of the squad together hopefully we've got a great chance of being in the same position this time next year," said Tully. "I'm very proud of the players and their effort and commitment over the two legs," he added to BBC Radio Cornwall. "I thought for 60 or 70 minutes, until they scored their goal, we were the better team, we just couldn't put the ball in the back of the net. "That's been our problem over the two games - they've taken their chances and we haven't." Truro are in their first season back in the second tier of non-league football, after winning the Southern Premier League play-offs last season, having overcome financial problems that almost led to the club going out of business. "For us to finish fourth, from where we've been two years ago, it's a great achievement," added Tully. "We had a poor start, losing 6-0 at home to Oxford and everyone thought we were dead certs to be relegated, so to finish fourth for a club of our size and with our budget, it's brilliant."